If you would like to enrol as a patient at Pyes Pa Doctors, please click on the image below to download our Patient Enrolment Pack. Complete these forms and bring them to us at 83 Pyes Pa Road (Pyes Pa Shopping Centre, Tauranga) or The Lakes Village Shopping Centre (9am-noon, 1 Caslani Lane, The Lakes). 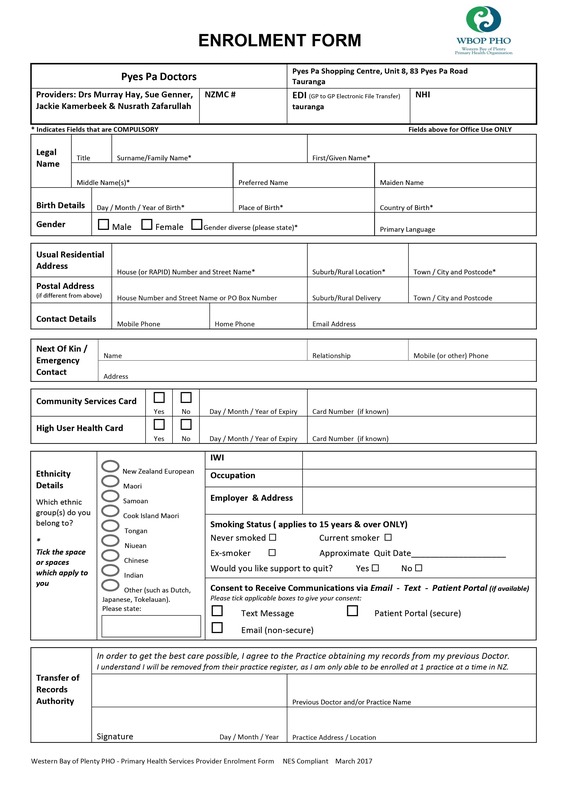 An Enrolment Form and Health Questionnaire need to be filled out for each person. Alternatively, you can pick up forms from either location and fill them out on the spot or bring them back later. Click here to download the Patient Enrolment Pack in PDF. After we have received your medical file from your previous GP, we will contact you asking you to make a nurse New Patient appointment. We cannot normally see you until the notes from your previous GP have arrived. The nurse appointment is approximately 30 minutes long and she will go through your medical records with you. This costs $30. Once you have completed the nurse New Patient appointment you can then make a doctors appointment as required.